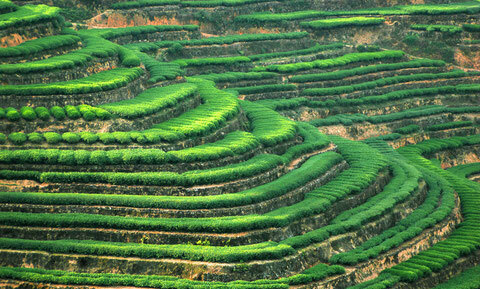 China is the homeland of tea. It is believed that China has tea-shrubs as early as five to six thousand years ago, and human cultivation of teaplants dates back two thousand years. All tea trees in other countries have their origin directly or indirectly in China. The word for tea leaves or tea as a drink in many countries are derivatives from the Chinese character "cha. 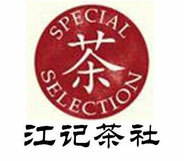 Chinese teas are usually numbered, first being the highest grade and down from there. There's no set stopping point, but generally 7 or 9 is what most people deal with. Again, this is specific to the leaf style and shape and how perfectly that was executed in production. Chinese tea names are often poetic and descriptive of the leaf ('hairy crab', 'longevity eyebrow', 'red snail'). Some can also indicate where the tea came from - Yunnan, for example, is a well-known tea province in China, and actually, the birthplace of all tea. Excellent tea is relatively rare to find, because the entire procedure is done by hand. Pure handmade tea has adopted a strict, machine free process along every step. The leaves are picked leaf by leaf through tea famer's hand. 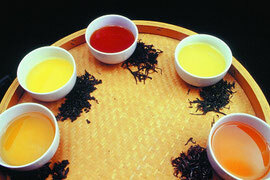 Although handmade tea production is realtivley low, its flavor is particularly pure and tasty. Though manufactured tea is produced a large quantity, these leaves will lose lots of nutrients and original fragrance during the process.